The speed of mobile and electronic banking has given customers high expectations when it comes to service. These same customers expect to have speedy, open lines of communication with bank staff as well. Don’t put your vital client relationships in danger by allowing them to experience frustration and long wait times when trying to contact a bank employee. An increasing number of banks and credit unions have chosen to switch from traditional phone systems to one of the new, updated solutions. An updated business communication solution can integrate your voice, Internet, data, and messaging all in one place. The right business telephone system will meet all concerns regarding accountability, call recording, cost control, and management of an increasingly mobile workforce. Bank customers expect to have easy, reliable lines of communication with those whom they’ve entrusted to handle their financial assets. Consistent, direct communication is key to building the trust necessary for a long-term business relationship. Without a reliable telephone system in place, you cannot succeed in this process in a way that fulfills and satisfies your clients’ needs.  With decades of experience, the professionals at Action Communication have the knowledge and expertise to meet the unique communication demands of banks and credit unions like yours. Whether it’s a VoIP, cloud-based, digital, or hybrid solution, we will help you choose a system that’s sophisticated, yet easy to use and manage. Our team of certified and highly experienced engineers have designed and deployed powerful communication solutions for numerous financial institutions of varying sizes. The right business phone system will cover the unique needs of the banking industry, while saving thousands in overhead and enhancing productivity. Meet all regulatory and accountability requirements. You’ll have integrated call recording and tracking. Integrated communication system that fits your budget. Upgrade to a powerful enterprise level solution that integrates all voice, email, text messaging, video conferencing, data, and Internet services with low capital investment requirements. Instant workforce mobility. Calls can ring in your main office and on your smartphone simultaneously. Initiate and join video conferences from your phone, laptop, or tablet device from wherever you are and at any time. Any space is your space. Move from desk to desk or office to office and access phone, data, and Internet services as if it were your own. Call Action Communication today for a no obligation consultation to explore the possibilities for your bank or credit union.